The NFL Draft Show staff's Patrick Woo and Mike Wargon take a closer look at Michigan State cornerback Darqueze Dennard ahead of the 2014 NFL Draft. For continuing coverage, follow @NFLDraftShow on Twitter. Erin is a junior intending to major in Film, but with a soft spot for Broadcast Journalism. Her love of videography and multimedia compel her to exercise these skill sets in as many areas as possible. She hopes to work behind the scenes in either a newsroom setting or perhaps concentrate her work into the field of Cinematography in collaboration with a major motion picture studio. Phil Constantino is a junior from Farmingdale, NY majoring in broadcast journalism with a minor in political science. Phil is also the website and social media director at ComRadio, and one of the station’s feature broadcasters. Bryan McSorley is a senior majoring in broadcast journalism from Conway, Pennsylvania. 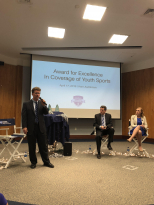 He has gained valuable experience in the broadcast field through his work with ComRadio, Centre County Report and his internship with Penn State Intercollegiate Athletics. As a member of ComRadio, McSorley has worked as play-by-play broadcaster, color analyst and board operator for many NCAA sports. He also co-host ComRadio’s Inside the NFL radio show. McSorley was the technical director for the Centre County Report starting in the spring of 2013 and has continued work with them this semester. In the future, McSorley dreams of working for a major sports production company either behind the scenes or in front of the camera. Allie Rothman is a senior majoring in broadcast journalism with a minor in kinesiology. She is from West Chester, Pa. and plays ice hockey for Penn State. Allie is a passionate Philly sports fan.